With the release of The New York Young Lords and the Struggle for Liberation, I am available for speaking engagements on the topic of my book or my new project, which examines the articulation of coloniality in U.S. Congressional discourse about Puerto Rico’s status (1897-1917). If you’re interested in scheduling a book reading/discussion or other lecture, please email Darrel Wanzer-Serrano or use the Contact Form. Please put the words “Speaking Engagement” in the subject line. 1/27-1/28: MLK Symposium at Dickinson College, sponsored by the Popel Shaw Center for Race & Ethnicity. The key event will be a discussion including me and former Young Lords Iris Morales and Denise Oliver-Velez, which will be on the evening of 1/27. I’ll also be doing classroom visits and other discussions over the two days. More information about the week’s events can be found here. 3/3-3/4: Two events sponsored by the Center for Teaching Excellence and the Center for Social Justice at the University of Oklahoma. On 3/3, I will be presenting the chapter “Figural, Not Foundational: The New York Young Lords and Revolutionary Nationalism” in a campus lecture at Gaylord Hall Auditorium, Room 1140, from 7:00-9:00 p.m. On 3/4 from 2:30-4:00 p.m., I will be facilitating a teaching workshop on “Decolonial Love,” at Bissell Library, Helmerich Collaborative Learning Center Classroom. 8/26: Radio Interview on WORT’s A Public Affair at 89.9 FM in Madison, WI. Click the link above for a Facebook event for the program. Once the interview is over, it should be available as a podcast via Soundcloud. 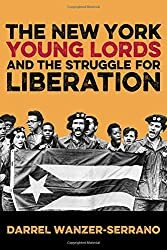 This interview will be about the book and the Young Lords and will be hosted by Karma Chavez, Associate Professor at the University of Wisconsin – Madison, and regular host of the radio program. UPDATE 8/27: The full interview is available for streaming and download. 9/23: King Juan Carlos I of Spain Center at New York University; New York, NY. This presentation (7:00 p.m.) is part of a roundtable sponsored and moderated by Juan González, who is a former Young Lord and the current Andrés Bello Chair in Latin American Culture and Civilization (the first US Latin@ to hold this chair). Other roundtable participants include scholars and former Young Lords. Discussion will be followed by a Q&A and a reception. More details and a livestream link can be found here. 9/24: The Loisaida Center; New York, NY. This presentation (at 6pm), based on the third chapter of my book, will be presented at the tail end of the ¡Presente! The Young Lords in New York exhibition at The Loisaida Center. Information about the event can be found here. 9/26: La Casa Azul Bookstore; New York, NY. This presentation (at 2pm), will include a short reading, an explanation of the process of researching/writing the book. It will leave lots of time for Q&A and will be followed by a screening of Millie and the Lords. 10/16: Centro Symposium on the Jones Act and its antecedents; New York, NY. This presentation will feature work from my new project on Congressional debates over Puerto Rico’s status. Centro has published a list of participants and synopsis of the event (PDF). 10/29: University of Wisconsin Department of Communication Arts‘ “Rhetoric, Politics, and Culture Colloquium”; Madison, WI. This free colloquium presentation will feature work from my new project on Congressional debates over Puerto Rico’s status, and it begins at 4pm. 11/14: Galería de la Raza; San Francisco, CA. This presentation (at 1pm), will include a short reading, a discussion about the process of writing/researching the book, and more. It will leave lots of time for Q&A and will include the opportunity to have your book signed. Modern Times Bookstore will have copies of the book for sale at the event. A Facebook event for this is available here. 11/15: Howard Zinn Book Fair; San Francisco, CA. The book fair brings together a host of projects — books, zines, and more — in the spirit of Howard Zinn’s commitment to histories from below. I’ll be presenting from the second chapter, on revolutionary nationalism, and answering questions about the Young Lords and the research/writing process. A Facebook for the event is available here. 11/19-11/22: National Communication Association Convention; Las Vegas, NV.